So far, 37 stores have joined this unusual movement. 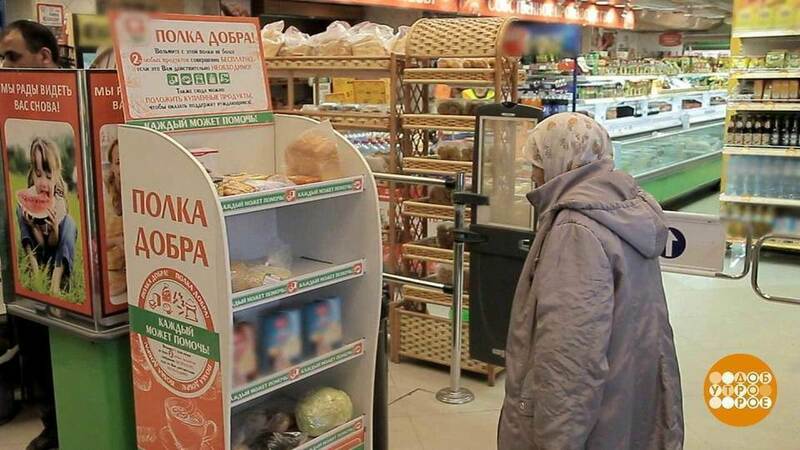 The ‘shelves of kindness’ are filled up by the store customers themselves, by the ones for whom buying an extra loaf of bread or an extra package of tea to help out a lonely ‘babushka’ (grandmother) is not really that difficult. The cashiers and volunteers of the initiative keep an eye on the shelves so that the products only go to those who are truly in need of them. “Of course, we won’t allow a person who just bought beer and cigarettes just take the bread and butter,” said a volunteer of a charity movement called “Time for Kindness,” Svetlana Vasilchenko. People of various ages and professions participate in the movement: students, teachers, doctors, janitors. This grassroots movement reflects what seems to be a growing trend in Russian society: an interest and enthusiasm for social work, arguably unprecedented for the country. Russia historically has lacked strong volunteer-based charity structures, but there seems to be a growing consciousness about citizens in need and more organized attempts to address social ills. And while this particular 'free food' endeavor is organized by secular groups, it is symptomatic of the national push for more social work on a volunteer basis, a movement that has largely been inspired by and spearheaded by the Russian Orthodox Church over the past few years.